Members of HMNZS Te Mana's Ship's Flight Crew recieve a surprise visit from a humpback whale off the coast of Jervis Bay, NSW. Image via Commonwealth of Australia, Department of Defence. Defence Science and Technology (DST) Group, together with four Australian universities, has completed a seven-year project that will help inform the Royal Australian Navy’s use of sonar and the oil and gas industry’s marine operations. The Behavioural Response of Australian Humpback Whales Seismic Survey (BRAHSS) was a seven-year, $9.5 million international project in which the reactions of humpback whales exposed to noise were studied while they migrated along the Australian coast. 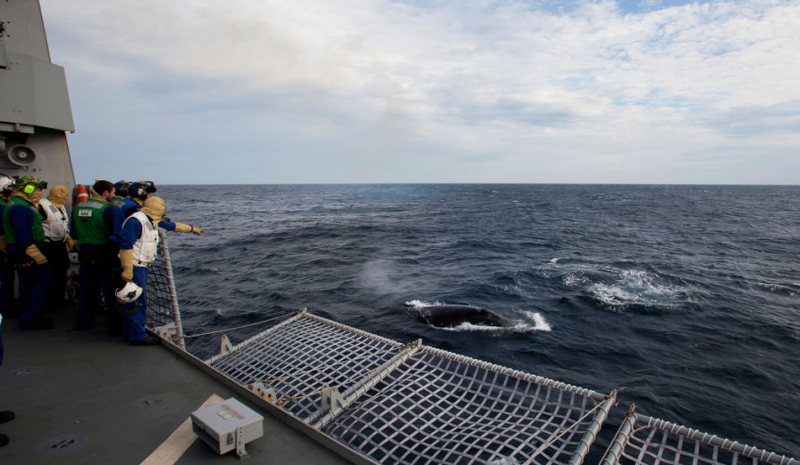 DST Group said Defence and the RAN are interested in the outcomes of the study due to large numbers of whales migrating annually through key Defence offshore exercise areas. The RAN currently has special mitigation measures in place to ensure its activities as far as reasonably practicable do not adversely affect whales and routinely reviews its procedures when new information becomes available. The BRAHSS project, undertaken by DST Group and researchers from Sydney, Queensland, Newcastle and Curtin universities, involved extensive field work and data collection by teams working along the Queensland and West Australian coasts. The study was funded by the International Association of Oil and Gas Producers and the US Bureau of Ocean Energy Management. It was led by DST's Maritime Division and Professor Doug Cato, who has more than 40 years experience researching sonar performance and ocean acoustics. While the findings are still being analysed, the results show whales tend to change their movements to avoid noise sources, DST Group said. The study will further inform the RAN's use of sonar and the oil and gas industry’s marine operations. The RAN said it's use of active sonar is "infrequent" and is usually only used during occasional exercises with submarines, or switched on briefly for a daily functionality check. "Sonars are inactive at most times when RAN ships are at sea," the RAN's website states.